An increasing percentage of Americans say the U.S. Food and Drug Administration (FDA) should move more quickly in order to get new treatments to patients, even if it means there may be risks. In 2015, 38% favor faster regulatory review, compared to 30% in 2013. Meanwhile, 25% say the FDA should act more slowly in order to reduce risk, even if it means patients may wait longer for treatments. Another 19% are undecided on this question and 18% do not agree with either position. When it comes to rising health care costs, 46% say research to improve health is part of the solution, while 28% are not sure and 26% say research is part of the problem. Meanwhile, 41% say that the roughly 1.5% of government spending allocated for biomedical and health research is not enough. Nearly one-third (29%) say it is about right, 21% are not sure and 9% say it is too much. And a plurality (44%) say they are willing to pay $1 per week more in taxes if they were certain that all of the money would be spent on additional medical research, while 32% say no and 24% are not sure. Investing in research is important to job creation, technological breakthroughs and economic growth, according to a strong majority of those surveyed (79%), and more than half (53%) say it is important that the federal research and development tax credit, which helps businesses plan ahead when it comes to R&D spending, is made permanent even when told the federal government loses billions in revenue annually with this credit. Currently, only 27% of Americans believe the U.S. has the best health care system in the world. More than half (57%) say it is important that the U.S. is a leader in medical and health research. Twenty-six percent say it does not matter where in the world medical and health research takes place, U.S. consumers will benefit regardless, and 18% are not sure. Confidence in the current system in the U.S. for evaluating the safety of vaccines and recommendation for when they should be given dropped to nearly half (56%), compared to 85% in 2008. 56% of Americans favor expanding federal funding for research using embryonic stem cells. More than half (55%) of Americans are willing to share their personal health information to advance medical research. An even higher percentage (60%) say they will share personal health information so that health care providers can improve patient care, and 46% percent are willing to share information so public health officials can better track disease and disability and their causes. 73% of Americans say the federal government should assign a higher priority to improving education focused on science, technology, engineering and mathematics (STEM) and careers in those fields. Studies show that certain health problems such as diabetes, heart disease and infant mortality happen more often among minorities or citizens with lower incomes. More than two-thirds of Americans (69%) say it is important to conduct medical or health research to understand and eliminate these differences. The poll data summary also includes national public opinion polling on eye and vision research. 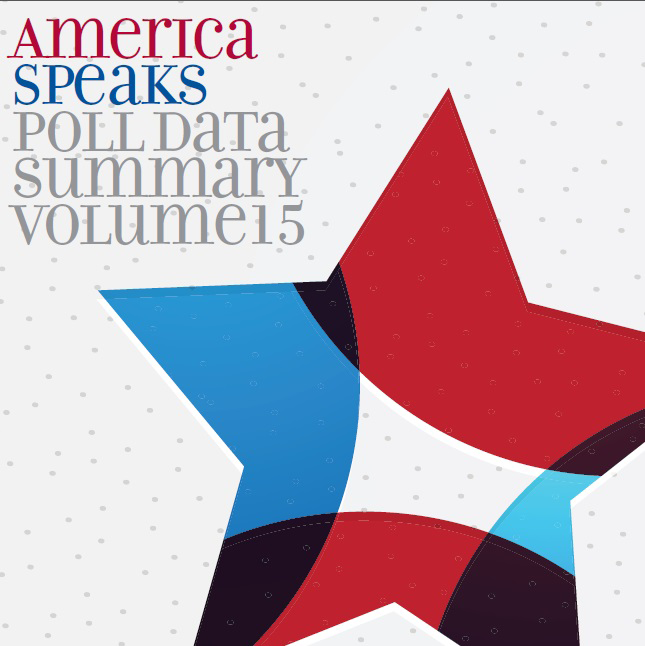 To view America Speaks, Volume 15, visit: http://www.researchamerica.or/AmericaSpeaksVolume15.This publication is made possible through a contribution from the American Medical Association. Research!America began commissioning polls in 1992 in an effort to understand public support for medical, health and scientific research. The results of Research!America’s polls have proven invaluable to our alliance of member organizations and, in turn, to the fulfillment of our mission to make research to improve health a higher national priority. In response to growing usage and demand, Research!America has expanded its portfolio, which includes state, national and issue-specific polling. Poll data is available by request or at www.researchamerica.org. Online polls are conducted with a sample size of approximately 1,000 U.S. adults (age 18+) with a maximum theoretical sampling error of +/- 3.2%. Data are demographically representative of adult U.S. residents. Polling in this publication was conducted by Zogby Analytics.